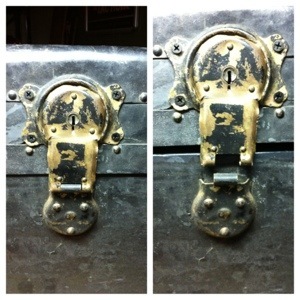 Home › Uncategorized › New Project: Attempted Antique Trunk to Beer Cooler Conversion. 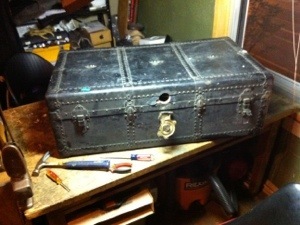 I bought this trunk at a local goodwill, probably somewhere around this time last year. As I only paid 8.99 for it, I was okay letting it sit a while. As you can see, it is not without its issues. 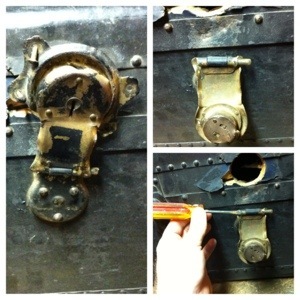 Namely the blown-out lock and the gaping hole where it used to rest. That no doubt happened in an attempt to make sure the trunk was empty. Since I’m dealing with structure and basic outer appearance at the moment I need to see if the lock assembly is salvageable. It is, but not amazingly so. Since I’m not concerned with locking my cooler, the answer here is to make it look like it works, and work around it. 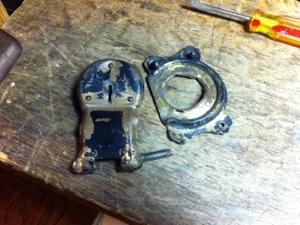 I started by removing the mangled back plate, then went to work on releasing the hinged part. For the hinged/swinging piece I needed to bend the edges out so I could hammer out the hinge pin. I decided that I wanted to mount these pieces back in their original places, but as static pieces that just appear to function. Here you see the parts (after being hammered mostly back into proper shape) mounted temporarily back in place to show the new visual function and ensure a good fit. I plan to replace those obvious screws with something a little cleaner looking after I get to the next step. So far all I’ve done here is work out the basic function and general appearance of the lock area… So, not much yet, but such is life. As I’m not really much farther along than this at the moment, here is where we will stop. I’ll pick back up in a few days with gutting the insides, reinforcing, and a better plan of action.